This book contains all of the rules necessary to resolve Combat. The basic combat system uses a comparison table. The Characteristics and Abilities of the Character involved are an important factor that, to a large degree, determines what the result of conflict will be. The Magic Rules contained in this book allow Players to create and use magic-using Characters. The Basic Magic System, all factors of a magic-user"s education and a detailed description of the basic spells are all included in this book. The primary factors that influence Magic are the MEL and EL of the magic-user and the MDV of the target. Other factros may be applied by the Referee as he sees fit. Rules for doing so will be found in this book. Finally the book contains the basic operating parameters for the Innate Magics that Characters can use as a result of advantageous Special Attributes. Use of these skills will require that the Referee fairly ejudicate the potentials of the power when it is derived in this way. 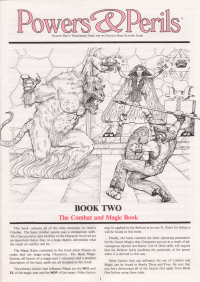 Other factors that can influence the use of Combat and Magic can be found in Books Three and Four. Be sure that you have determined all of the factors that apply from Book One before using these rules. List of all spells, including recent additions, in a condensed format for quick reference. Refers to the original rules in places for more lengthly explanations.